This year I have gone overboard on Hydrangeas! A few years ago I was afraid of them and avoided them. After owning a Nikko Blue Hydrangea for many years and it only bloomed a few times I had gotten turned off about them. I got turned back onto them with the variety known as Endless Summer Hydrangeas and my confidence was renewed! It's has very large panicles- up to 16" I've read. My shrub is not very large, but by next year I expect to see it develop nicely! This picture is a close up of two levels of the flowers growth...the white is how it starts, then it goes to the pink color...they have firm stalks and paper like feel when they get to the pink stage. 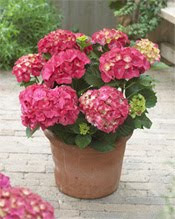 Another newcomber is this Paris, from the Cityline series, a dwarf Hydrangea.